It's as if there's a ghost-story behind the text and nobody knows it's there but me. Still on Chapter Seven of The Graveyard Book, but I'm well into the last half of the chapter, and it no longer feels like I'm walking towards the horizon, with the horizon retreating as I advance... I've written about eleven easy pages today, and cannot wait to get back to it. If I'm still awake and writing I may pull an all-nighter. It barely feels like I'm writing it. Mostly it feels like I'm the first one reading it. And look, Bill Hader is selling Lafferty to the world, via the New York Times. Labels: Bill Hader, R. A. Lafferty, The Graveyard Book, why write? Promoting a new book is hard, especially when you're a first time author. It doesn't matter how good the book is or how nice you are, you'll still wind up doing signings for empty rooms, if you're lucky enough to persuade someone to let you do the signings. Still, all of that has to be easier than finding yourself in a world where your first novel is coming out and you are not in a position to promote it. Sometimes the entire literary blogging community will gather around and make sure that, if you can't be out there promoting your book, they'll do whatever they can to help and point people to it. And sometimes an author in the middle of a book will look up and go "Hang on. The 28th. That was yesterday? I thought it was.... oh bugger." The book is called The Liar's Diary. The author is very apologetic. What happened was the US Post Office. I got the second one in a year ago, painted and collaged on it, sent it off (insured) to the CBLDF. Then we waited. It didn't arrive. And then we discovered that simply insuring something for a value doesn't really matter if the Post Office doesn't want to pay... A saga that went on for a year. Dave Sim just sent me a new 2007 lithograph -- I think this may be my personal one -- which I plan to art all over and give to the CBLDF to auction, to make up for the one the Post Office lost. And I think we'll send it FedEx, as well, just to be on the safe side. And the 2008 one should happen fairly soon -- possibly to coincide with the New York Comic-Con. We'll see. I've noticed on your blog that you often say the stories you write have been in your head for years. I was wondering, do you deliberately leave ideas gestating for years before doing anything with them, or is it simply because you have a large backlog of ideas? I've noticed with my own writing that for some reason, the older the idea, the more comfortable it feels to write. Do you find that? A bit of both. Sometimes it's nice to have an idea for a book or a story in the back of your head for years, accreting bits to it, growing and becoming bigger and more interesting, sometimes it's a worrying thing having a story you'd like to write and aren't getting to, for very occasionally, alone in the darkness, they die and rot and turn to mould and slime. It tends to be less intentional (except for The Graveyard Book, which was a better idea than I was a writer twenty years ago) than to do with how much I write and who's waiting for what. The (P.S.) editions of the books on Amazon.com are the large format "trade paperback" editions, with interviews in the back (and, in the case of Anansi Boys, an extract from American Gods) published by Harper Perennial. The (P.S.) edition of Anansi Boys has a cover that's electric blue and eye-burning yellow, and is unmissable. It's bigger than the "mass-market paperback", printed on better paper, but contains the same novel. I can't find a good image of it online, so here's the new cover of the P.S. 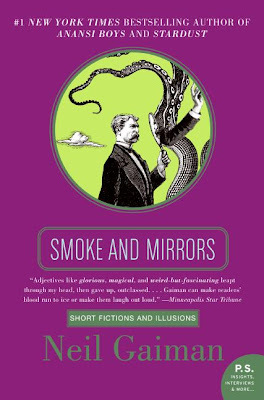 trade paperback of Smoke and Mirrors, which comes out later this week, a vision in purple and green. Why are you writing just kid's books? Why don't you write another adult novel? It's too bloody cold out there. It's going to be 29 below zero (F) tonight -- 35 below with windchill (which is minus 37 C). It hurts to walk down to the bottom of the garden to write, and it hurts to walk back. I don't think I'm going to walk the dog much tonight. Right. Back to Chapter Seven. Sorry about that -- I got so irritated with trying to blog by email that I stopped. Now all is well technically, and I thought the world deserved a proper blog entry, albeit a short one. 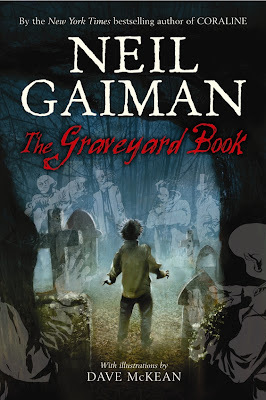 The Graveyard Book is back on track, I think, and the thorny and evil thicket that was Chapter Six has been traversed and, I am told, does not sound like I was making it up as I went along, but sounds as if I knew what it was about the whole time. This makes me happy, because it was miserable writing it. Chapter Seven is being written right now, I'm enjoying writing it and I do sort of know where it's going (I have for years) but it seems to be willing to surprise me anyway. A dead poet that I wasn't expecting just showed up, named Nehemiah Trot, who has "Swans Sing Before They Die" on his tombstone, and, I hope, will never know why. I am, as I said, really enjoying it. Having said that, there are a bunch of introductions to things I agreed to write with end of January deadlines (as I was certain that I'd be done the The Graveyard Book by then) that are a bit of a distraction. One very frequently asked question here is Can I Recommend a Book For A Young Reader? And the answer really is, no, I can't, not without knowing the Young Reader in question. Different people like different books, and age isn't much of a guide to that. But what I can now do is point anyone at this rather wonderful Daily Telegraph list of 100 books every child should read, broken into three sections (young, middle and older readers). It's a terrific list, and I say that as someone who's read to myself, or read aloud, many of the books they suggest, and not just because they've got Coraline on there. There's an article on Stephin Merritt in the New York Times. Also, I'd like it to be a bit lighter still. I wish my new Panasonic W7 was lighter, and it's about 8 ounces less than the new Macs (edited to add: and it comes with a DVD drive and a hard drive that's double the size of the current Mac air. On the down side it came with Vista, which is, so far, like Windows XP only slower). Neil, on 27 December, you said, There would be a lot more White German Shepherds around if the Nazis hadn't decided they were racially inferior and needed to be cleansed from the gene pool. Of course, the same could be said of my family. Howcome you don't talk about that side of your family? Normally because it's not something I think about, nor something I'm comfortable with, and it rarely works its way into conversation. I remember the first time I really became aware of what happened to my family in World War Two. It was when, aged about 11, I had to do a family tree as a school project. This was only twenty five years after the end of the war -- not a long time, not really, although to me it was an age, and WW2 was ancient history. I discovered as I drew the family tree and talked to relatives that, for the most part, my family, in Poland and Germany and all over Eastern Europe, went into concentration camps and didn't come out. On my paternal grandfather's side alone, a huge extended family was pretty much reduced to my great-grandfather and his children, who had come to England, and three sisters from Radomsko in Poland, who survived by fortune and their wits. One of those sisters was my cousin, the remarkable Dr Helen Fagin, [she was my grandfather's first cousin -- my great-grandfather was her uncle], and has just been honoured by New College of Florida in Sarasota for her work in Holocaust Education. Like Fagin's writings and teachings, the 1,000-volume collection emphasizes what she calls "the moral lessons" of the Nazi extermination of 6 million Jews. "While it is important to learn about the Holocaust," she says, "it is even more important that we learn from the Holocaust." The most chilling of those lessons, to her, is that extermination, civilization's ultimate betrayal of its own humanity, was the work of highly civilized people. "These were educated, erudite individuals, thinkers, who came to the conclusion that the final solution was perfectly plausible. "And then they were able to enlist the help of chemists to devise an efficient gas for extermination, and architects to design an efficient death house, and industrialists to create the machinery of annihilation." The lesson of the Holocaust is not that human beings are "somehow capable of resigning from their human obligations to one another," she says, but that "they do so out of conscious moral choice." And she's right. The worst part, for me as I said in American Gods, is that some, perhaps many of the people who killed my family and six million others had, I have no doubt, convinced themselves that they were good people doing the right thing. is a really lovely New York Times article about Beowulf, and what Roger Avary and I were trying to do, that makes me very happy. Meanwhile, I'm having real problems logging in to things, like Blogger. But am writing, so that's all right. which is the part of the website which is just Macbeth. It also includes NPR interviews and details on the whens and wheres (Red Bank NJ and then Washington DC). Want to read something really cool? Something beautifully written that's all about art and blood and magic and horror? And Shakespeare? And the theatre? Something that's about the enthusiasm of art? The joy of putting talented people together and building something that hasn't been done before? About making people see things that aren't there? About lying in the service of art? Honestly, you do, even if you think you don't. and read forward, an entry at a time, as Teller blogs the year of creation of a magical, bloody production of Macbeth. Take your time. It's like reading a good book. I'm mostly writing The Graveyard Book right now, and tending to let things like email, answering the phone and keeping up this blog slide. Apologies. I was wondering, though considering the origins of your dog Cabal I might be incorrect in my thought, if you knew of anyone who breeds White German Shepherd Dogs, or Alsatians as you referred to them in your post? My specific inquire is because I am inclined towards a German Shepherd Dog, while my girlfriend would prefer a white dog of some kind. I didn't realize there was a white breed of the dog, nor that they were recognized enough to be bred purposely. In either case, I would be quite glad of your opinion on the matter as an owner of said breed, and if you do happen to have any knowledge as to where to find a Breeder, I would be most thankful. I can't recommend any breeders, because I didn't get my dog from one. A quick google shows that there are quite a few breeders out there though (http://www.pets4you.com/wgshep.html has some of them). But before you head off to the breeders, let me point you to petfinder.com -- it lists rescued and homeless animals of every kind from animal sanctuaries all across the US and Canada. You want a goat? Or a Llama? They have goats and llamas that want to come and live with you. Not to mention pigs, horses, cats, iguanas... and dogs. (My assistant Lorraine has recently become obsessed with bengal cats, and I just pointed out to her that there are a lot of bengals out there who need good homes.) You want white german shepherds? Go to Petfinder, type white german shepherd as the breed, put in the age and gender of dog you're looking for (or leave them out if you don't mind), your zip code, and in moments you will be able to stare at a remarkably large number of cool white puppies and dogs who need someone to guard and adore. I wrote a while back inquiring about a few projects that have been mentioned, delayed, and not mentioned again for some time. Any word on "Crazy Hair" with Dave McKean (I have made my daughter a fan of the "children's" books) or comic version of "The Facts in the Case of the Departure of Ms. Finch" from Dark Horse? Dave McKean finished Crazy Hair and handed it in early in 2007. I know it's on the publishing schedule at both Bloomsbury and HarperChildrens, but am not sure when it's on the schedule for. ...Miss Finch is all finished, and I believe has gone off to the printers, and should be in shops within the next few months. The Neverwhere Audio book is, at a guess, about eight thousand words longer than the US hardcover and about fifteen thousand words longer than the original UK hardcover. It's the same text, more or less, as the current UK edition. Thanks for your little tribute to George Macdonald Fraser on your journal. I had a very sad day yesterday when I realised that I was never going to read the "Zulu Wars" Flashman which I have been waiting for for years. Is Fraser, like Kipling, one of those authors which you get a little bit of stick about from your young and trendy readership? I don't think I've got stick for liking Kipling's work for a good twenty years now, and the people I got stick from back then hadn't read Kipling -- they just knew he was a Bad Thing. Nobody's ever written to me taking me to task for the points of view in the Flashman books not being those of today. I do keep getting letters from people saying what a pity it is that they won't get the Flashman fighting on both sides of the Civil War, or Flashman in the Zulu Wars stories. Me, I'm just glad we have the Flashman books we've got. Authors die with books unwritten, and that's not the worst thing in the world. Always leave them wanting more. Having said that, I also find the "Good old Flashman, what a great and lovable fellow he was," tone of some of the obituaries and blogs faintly perplexing. For me, the joy of Flashman as a character is that he wasn't a great fellow at all: he was a monster and a coward, shifty, untrustworthy, a bully and a toady and dangerous to boot. I'd first met him and loathed him in Tom Brown's Schooldays, which I'd read when I was eight or nine, as he toasted smaller boys in front of open fires, and then I discovered the book Flashman when I was twelve, which begins with him being expelled from Rugby for drunkenness and stumbling lecherously into a world in which, because he looks like a hero, he is often taken for one. I like the early books best, in which he does a lot of running away. In the later books, people expect him to act heroically, and, often to avoid losing face, he actually does, which I found a bit of a disappointment. It's more fun when events conspire to make his attempts to do something petty and self-serving, or at least his attempts to save his skin or get laid, appear to be heroic. Flashman's attitudes are sometimes loathsome and sometimes practical. But I always expected (and got) good history from George MacDonald Fraser, along with a point of view. And Fraser's point of view was not Flashman's. Anyway, I like points of view that aren't mine. I learn things, even when I'm disagreeing. I know that on your site you discourage a lot of things like sending stories or "homework" and whatnot, and I can certainly see why. However, what I wish to send you (rather, to discuss with you) is not a story nor homework of any kind, but an idea. And most importantly, I don't want your help or your thoughts, but, and I know its a long shot, collaboration. So, in all seriousness, it turns out I am asking you if you would ever be interested in collaborating with a nobody and co-writing a story that will (and certainly will if you write it) be brilliant? And, is there any way that I can send you a hand-written letter that you can read which might be longer than this message, but which can say a lot more? Would you be interested in reading such a letter? Please, I will understand any response in the end; I am only asking for a chance. I'm sorry, but no. I have lots of ideas already. I don't have enough time to write my stuff. If your idea is good, then you should write it. If you're not a good enough writer to do it justice, then get better. Write other things until you're good enough. If you really want to collaborate with someone, then find a friend who writes, and wants to write with you. There is a hunted expression you can see on the faces of writers. All you ever have to do, if you want to see it, is to walk over to a writer of fiction and say, "You know, I have an idea for a story. I'll tell it to you and you can write it and we'll split the money fifty-fifty." You will watch their smiles glaze over and watch them back away. Because no matter how good the idea, the execution is everything. And the real work is done at the keyboard or huddled over the notebook, putting one word down after another. The only reason I can think of for collaborating these days, is for fun. I loved collaborating with Gene Wolfe on A Walking Tour of the Shambles because I couldn't wait to get the next envelope with the next four pages in it from him. 2. What's your favorite sound? 4. What, if anything, do you usually do to settle in and work on something? Is there certain music or atmospheric elements that help you? 6. Do you ever feel as if there are more things that flash in your mind or fly by your pen than will ever be captured or put down in some minutely concrete form? That is, do you find ideas and possibilities everywhere all the time or is it much more controlled than that? Any answers would be great, but you're a damned busy guy. Things to think about. Just know that you rock. A lot. 1) Tea. Normally bog-standard UK tea bags, and I'm not very choosy. Ty-phoo or PG Tips or the Clipper Fairtrade, things like that. 4) Not really. Getting away from the computer helps. Or at least, away from the internet. And not answering the phone. 5) Professionally? Twenty five years. 6)Are there more things in my mind than ever hit the paper? Of course. And are there ideas and possibilities everywhere? Sure. Not a question, but a suggestion re: frozen ink. Perhaps you may want to try Noodler's Polar ink (http://www.pendemonium.com/ink_noodler.htm#specialty - scroll down to Polar Ink)- it claims to be freeze proof to -20 degrees F, and is also waterproof on cellulose paper when dry. Incidentally, the black light-reactive Invisible Ink is also fun, and all Noodler's inks are intended for fountain pen use. Polar Ink ordered. I'll report back the next time it gets really cold. One of my favourite authors, George MacDonald Fraser, is dead (and I've replaced the not very good Independent Obit with the now up online Telegraph Obituary). It's not really surprising -- the last book of his that I read, The Light's On At Signpost, takes its title from his knowledge that he'll soon be dead (it's an odd book -- half memoirs of writing films, half grumbles about the state of the world, some of them brilliantly spot on, some, at least to my mind, repulsive or silly or both). He was a marvellous writer -- clear, sharp and, when he wanted to be, really funny. His most famous books are the Flashman series, of which I like the first half dozen very much, and like the later books less (not because they're less well-written or researched, but I think because Flashman softens, and I liked him best when he was at his most appalling), but I love the McAuslan stories and The Pyrates every bit as much in very different ways. He wrote some excellently crafted film scripts. I borrowed a historical story he told of murder and desire for Endless Nights. And I am currently reading -- again, doling out a story a night before sleep -- McAuslan Entire. You can find the publisher's blurb on it here. As a young man I preferred Fraser's Flashman stories to his McAuslan/Dand MacNeill stories; now I'm not so sure. (Possibly because I'm still out of sorts with a story in the last Flashman collection. Dammit, Flashman can't meet Sherlock Holmes. There was a compact with the reader about Flashman, and that breaks it -- it says, unequivocably, that Flashman is a fictional character, not a historical one, whereas up until that point the only fictional characters were from Tom Brown's Schooldays. In Royal Flash Flashman doesn't meet Rupert of Hentzau, he meets the inspiration for Rupert of Hentzau, and so on.) Sorry, I'm wittering. I changed the link to a dead publisher's website to the Amazon link for the (out of print) book. Excerpt - Back Cover: "... . ~~- ~. ~ . _ .. " N Neil Gaiman is the New Yak Times bat-sdrmg hWphor of Mnorkan rods ..."
And, of course, I am.